Amazon India Hello Moto sale has started, get Moto G Turbo mobile for Rs.11,499 at a Discount of Rs.1,000 in this amazon sale. Amazon India shopping is more fun on using SBI Bank creadit or debit cards since you can get additional 10% cashback. Amazon mobile store offers Motorola Moto G Turbo device for a less price so choose this best mobile to full fill all your requirements, Amazon India mobile coupons and Amazon coupons are included in image links for your convenience. 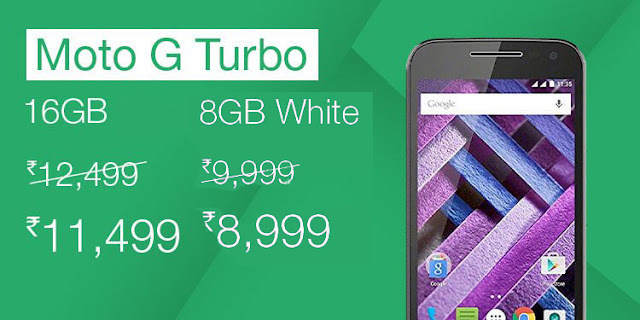 Moto G Turbo price in india is Rs.12,499, at Amazon India it comes for a price of Rs.11,499 only. Moto G Turbo comes with 5-inch HD display for best viewing experience. Moto G Turbo has a 13MP rear camera and a 5MP secondary front camera, capture every moment of your life beautifully. It comes with Android v5.1.1 Lollipop OS. 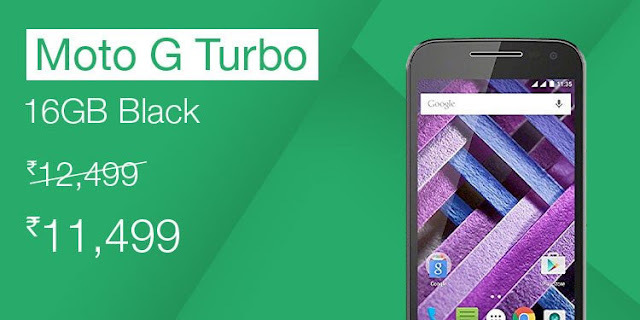 Moto G Turbo is boosted with 1.5GHz octa core Qualcomm processor. Moto G Turbo comes with 2GB RAM, 16GB internal memory and expandable up to 32GB. 2470 mAh lithium-ion battery charges very fast and lasts all day. Moto G Turbo has a very good cameras both front and back, clarity is very good. It have heating issues on using it continuously for many hours but after updating mobile it's fine. Mobile works freely and there are no lags, gaming experience is good. Overall it is rated at 3.5/5 stars. 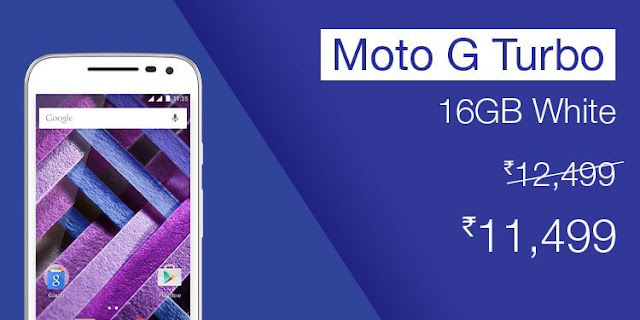 Also see Moto G and Moto G 3rd Gen mobile with flat Rs.1000 offers here.